1. Link a Twitter account: To link a Twitter account, click on the ADD TWITTER ACCOUNT button (FIG2.1). This will route you to a Secure Twitter Page where the authorization tokens can be exchanged with BlasTwit. Once your authorize Twitter to use BlasTwit you will be routed back to the settings page and your Twitter Name should be visible in the list (FIG2.2) NOTE: There are times that credentials are not passed correctly by twitter. If your tweets are not broadcasting you may need to remove and then re-link your twitter account. 2. Set your Time Zone : TO enhance the BlasTwit experience, we recommend setting your Time Zone. To set it click on the CHANGE TIME ZONE button (FIG 2.3). This will expand the window where you can select your zone from a list (FIG 3.1). Once selected click SAVE. 3. Subscribe to one of our Premium services: See Subscribing / Cancelling BlasTwit. 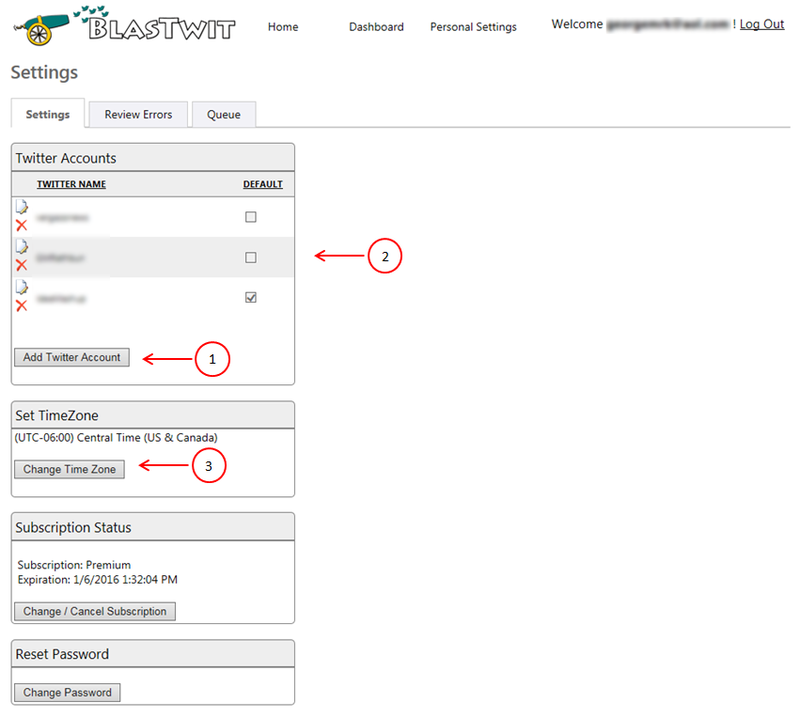 NOTE: When you first register with BlasTwit, you will be given a 7 day trial period of our premium service. At the end of the 7 days your account will be reverted to a Basic account (All lists and schedules will be deleted and associated twwts will be moved to the Default list. We recommend subscribing to the Premium service before the 7 day trial expiration.